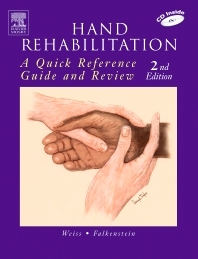 This one-of-a-kind reference provides a comprehensive overview of hand rehabilitation. Featuring a unique, question and detailed-answer format, Hand Rehabilitation guides the reader from basic information about hand anatomy through complex topics including the most advanced treatment techniques. Each chapter is formatted as a series of multiple-choice questions, complete with detailed answers and references to other hand therapy resources. There are practice questions included at the end of the book with perforated pages for detachment and copying. Also included are "clinical" gems in each chapter, providing the reader with helpful hints and important facts to remember related to certain subjects or questions. Chapters are organized in a building block fashion, beginning with anatomy and progressing to clinical application. Each chapter begins with a bulleted list of key topics. Advanced questions are denoted with an icon located after the answer/explanation, helping readers pinpoint areas requiring further study. Answer explanations include helpful references, including page numbers. A convenient Quick Reference Guide is located at the beginning of the book. The back cover contains a removable slide rule that can be removed and used in self-testing.